So when I heard about Time Tokens I was immediately interested, especially for the 7-year-old. Lola really loves them – I think she loves the empowerment of giving me the token, having her time, and then putting her timer and pack away with her iPod. She’s stuck to the parent-child contract, and got to go to the skatepark as a reward for sticking to it. One week she even had tokens left! 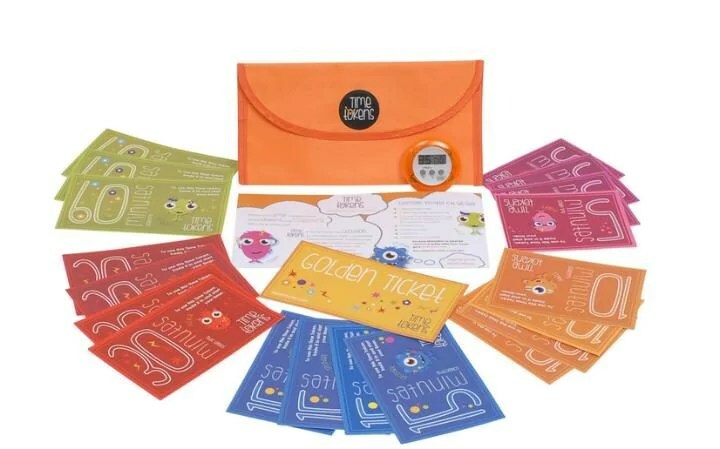 The Time Tokens pack includes seven hours of vouchers from 5 to 60 minutes, an orange timer, a Golden Ticket for reward for doing a great job and the parent–child contract. Worth noting I reduced our pack to five hours and that’s been ample enough time over the week. She did use them all up pretty quickly the first week, but understood that was that. I’m not saying she was happy with it, but it did make her think about how to use them the following week. She realised if she wanted to finish of the game she was playing, using a 5 minute token for a little extra rather than any longer worked best. It’s actually a really simple idea, which has been brilliantly put together. It’s easy for children to understand and manage. The full packs costs £14.95, a great investment. « Happy New Year (with a bonus round-up of our pick of the sales)!